Managing windows can be frustrating, requiring precision control of your mouse or trackpad for clicking, dragging, pushing and pulling your windows to the size and position you desire. Even with all this work, it’s very difficult to get windows exactly where you want them, so most of the time windows are left scattered all over the screen. 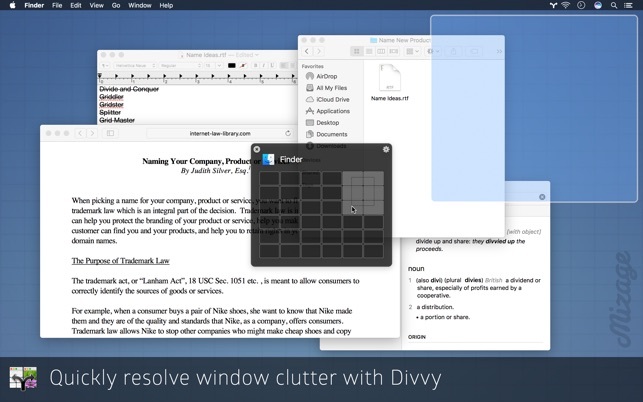 Divvy, a solution for both Mac OS X and Microsoft Windows, is an entirely new way of managing your windows. 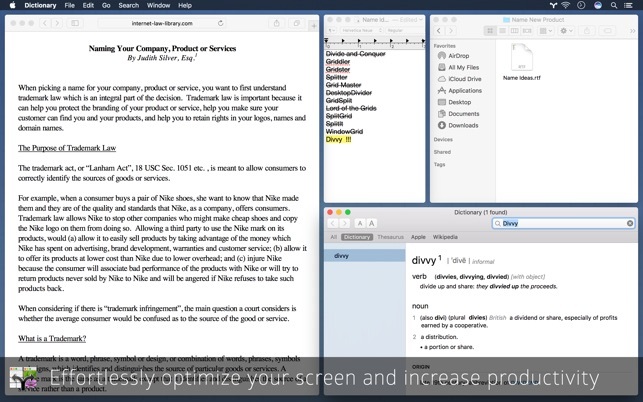 It allows you to quickly and efficiently "divvy up" your screen into exact portions. 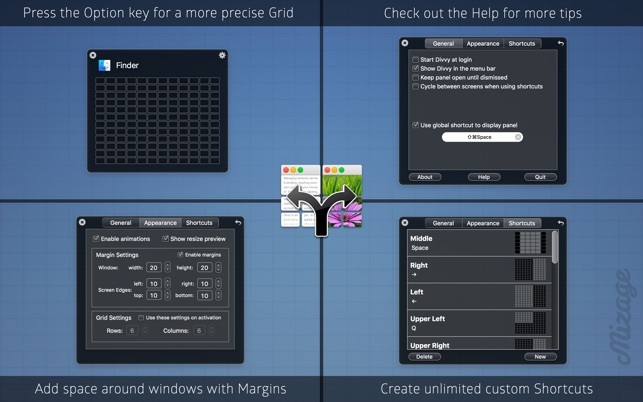 This lets you take maximum advantage of your screen real estate without any hassle at all. Window management has never been this easy. With Divvy, it’s as simple as a single click and drag in the Divvy interface and your window will be resized and moved to a relative portion of the screen. 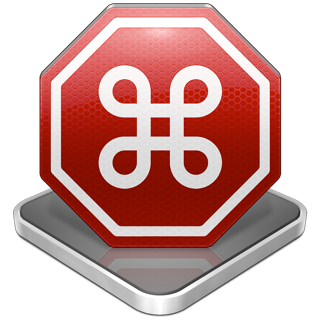 If that seems like too much work, you can go ahead and create as many different shortcuts as you'd like that resize and move your windows. Divvy is designed to be quick, simple and elegant, staying out of your way as much as possible while providing the most powerful window management available today. • Fix for Divvy crash when waking from sleep on the late 2016 MacBook Pros with Touch Bar. 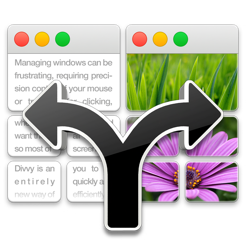 If you use unix window managers or use your Mac for professional work - this automation tool is crucial to speed / organize / automate moving windows in and out as your tasks change from hour to hour. Being able to quickly throw up 3 or 5 windows in a set pattern really helps me customize what information I need to synthesize or work on complex tasks, and that’s the whole point of a computer these days. I understand Apple’s decision to make side by side split view to cover most people’s needs, but this tool is incredibly useful once you grow past needing two window side by side. One of the few essential apps I use. I’ve used Divvy for a few years now. It’s very simple, and very effective. I have just a few global shortcuts defined on my laptop keyboard: left half of the screen (Command-[), right half of the screen (Command-]), and full screen (Command-Return). 95% of the time this is all I need, and I don’t have to move around windows or resize them with the mouse. There are times when I miss the wonderful, much more powerful tiling window managers on Linux I used to use — but ultimately I prefer something like Divvy for its simplicity. Divvy is the best of the bunch. It’s changed the way I use my computer. I am an editor and writer and often have many windows open and active at once. It is extremely useful to me to be able to program hotkeys to instantly move windows around. The question is, if you’re not using Divvy, why have you not yet tried it? Because once you try it, you will forget about the other window manager tools you’ve downloaded.